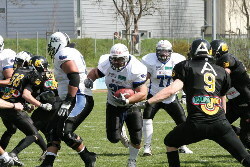 Cineplexx Blue Devils from Hohenems have won their first game of the EFAF-Cup Group stage against the Bern Grizzlies 30-0. Due to injuries Hohenems was forced to play whitout some of their starters but still did not have any problems handling the Swiss. For the first time this season Quarterback Paul Troth started for the Blue Devils. He did well and entertained the crowd of about 1100 with several nice passes. Hohenems is very close to the Swiss border and has several players from Switzerland. The "Swiss Devils" seemed to be very motivated. Runningback Tino Muggwyler scored one touchdown and rushed eleven times for 60 yards. Fellow Swiss, RB Eddy Coissy had ten carries for 74 yards. WR Christian Steffani proved his reputation and once again put on a good show, catching six balls for 109 yards. He also scored twice, on a 18 yard rush early in the first quarter and on a 20 yard interception return in the third. On defense Linebacker Lukas Kadek had his best game so far this season with six tackles. Lineman Alex Haritonenko (6 tackles, 1 sack) and Linebacker David Lamprecht (5 tackles, 1 sack) also had a solid game. Head Coach Mike Kegel was pleased with his team's performance: "I am glad that we won, that gives us some security for the second game." FUMBLES: Bern Grizzlies-R.Seccabian 1-1; E.Thompson 1-1. Blue Devils-C.Drake 1-1. 33 M.Egli             7    2  8.0     .     .   .    1-0     .    .      .     .
54 Mi.Schneider       6    3  7.5  0.5/1    . .     .      .    .      .     .
TM TEAM               5    . 5.0  1.0/1    . .     .      .    .      .     .
9  L.White            3    3  4.5  1.0/9    . .     .      .    .   1.0/9    . 70 A.Golay            2    1  2.5  2.5/16   . .     .      .    .   2.0/16   . 21 P.Kehrl            1    3  2.5     .     .   .     .      .    .      .     .
80 C.Berger           2    . 2.0     .     .   .     .      .    .      .     .
58 Z.Kupferschmidt    2    . 2.0     .     .   .     .      .    .      .     .
25 S.Schaller         2    . 2.0     .     .   .     .      .    .      .     .
55 D.Niederhaeuser    1    1  1.5     .     .   .     .      .    .      .     .
44 Ma.Schneider       1    . 1.0     . 1  1-0    .      .    .      .     .
56 T.Moser            . 2  1.0     .     .   .     .      .    .      .     .
88 C.Charpiloz        . 1  0.5     .     .   .     .      .    .      .     .
51 L.Kadek            5    1  5.5     .     .   .     .      .    .      .     .
59 A.Haritonenko      5    1  5.5  2.0/8    . .     .      .    .   1.0/4    . 16 D.Lamprecht        5    . 5.0  2.0/6    . .     .      .    .   1.0/3    . 44 R.Baunacke         4    . 4.0  1.0/5    . .     .      .    .      .     .
13 F.Dorlean          3    . 3.0  2.0/5    1  1-0    .      .    .   1.0/4    . 4  C.Drake            2    1  2.5     .     .   .     .      .    .      .     .
34 L.Wirtz            2    . 2.0     .     .   .     .      .    .      .     .
14 M.Kiehm            2    . 2.0     .     .   .     .      .    .      .     .
66 L.Auguste          1    1  1.5     . 1  1-0    .      .    .      .     .
88 E.Fussenegger      1    . 1.0     .     .   .     .      .    .      .     .
3  TF.Wu              1    . 1.0     .     .   .     .      .    .      .     .
22 M.Bunderla         1    . 1.0     .     .   .     .      .    .      .     .
80 B.Fussenegger      1    . 1.0     .     .   .     .      .    .      .     .
83 C.Steffani         1    . 1.0     .     .   .    1-20    .    .      .     .
86-R.Voncourt, 87-U.Kaenel, 88-C.Charpiloz, 89-D.Raques, 90-S.Blaser, 99-T.Frank. 80-B.Fussenegger, 81-A.Freter, 83-C.Steffani, 88-E.Fussenegger, 93-M.Kellenberger. M.Bunderla 1-minus 1; P.Troth 3-minus 25. INTERCEPTIONS: Bern Grizzlies-M.Egli 1-0. Blue Devils-C.Steffani 1-20. Devils-A.Haritonenko 1-0; D.Lamprecht 1-0; F.Dorlean 1-0. C.Steffani 1-0; TF.Wu 1-0; M.Bunderla 1-0; B.Fussenegger 1-0; E.Fussenegger 1-0. A.Golay kickoff 41 yards to the DEV25, out-of-bounds, DEV ball on DEV35. D 1-10 D35   T.Muggwyler rush for 1 yard to the DEV36 (M.Egli). D 1-10 G47   P.Troth pass complete to C.Drake for 9 yards to the GRI38 (S.Schaller). D 2-1  G38   PENALTY DEV delay of game 3 yards to the GRI41. D 2-4  G41   P.Troth pass incomplete to M.Kiehm. G 1-10 G35   BERN GRIZZLIES drive start at 12:00 (1st). G 1-10 G35   M.Niklaus pass incomplete to U.Kaenel. G 2-10 G35   R.Seccabian rush for 7 yards to the GRI42 (C.Steffani). G 3-3  G42   M.Niklaus pass incomplete to S.Blaser. D 1-10 D17   BLUE DEVILS drive start at 12:00 (1st). D 1-10 D17   T.Muggwyler rush for 4 yards to the DEV21 (C.Berger). D 2-6  D21   T.Muggwyler rush for 6 yards to the DEV27, 1ST DOWN DEV (M.Egli). D 1-10 D48   P.Troth pass incomplete to C.Steffani. D 1-10 G35   E.Coissy rush for 4 yards to the GRI31 (P.Kehrl;Mi.Schneider). D 2-6  G31   P.Troth pass incomplete to F.Dorlean. D 3-6  G31   P.Troth pass incomplete to C.Drake. D 4-6  G31   T.Muggwyler rush for loss of 1 yard to the GRI32 (TEAM). G 1-10 G32   BERN GRIZZLIES drive start at 12:00 (1st). G 1-10 G32   M.Niklaus rush for loss of 1 yard to the GRI31 (F.Dorlean). G 2-11 G31   M.Niklaus pass incomplete to C.Charpiloz. G 3-11 G31   M.Niklaus sacked for loss of 4 yards to the GRI27 (F.Dorlean). G 4-15 G27   B.Kohli punt 49 yards to the DEV20, C.Drake return -10 yards to the DEV10. D 1-10 D10   BLUE DEVILS drive start at 12:00 (1st). D 1-10 D10   TF.Wu rush for 3 yards to the DEV13 (TEAM). D 1-10 D34   P.Troth pass incomplete. D 2-10 D34   Start of 2nd quarter, clock 12:00. (Z.Kupferschmidt), PENALTY DEV ?? 9 yards to the DEV25, NO PLAY. D 2-19 D25   P.Troth sacked for loss of 11 yards to the DEV14 (A.Golay). D 3-30 D14   PENALTY DEV false start 5 yards to the DEV9. Ma.Schneider, fumble by C.Drake recovered by GRI Ma.Schneider at DEV15. G 1-10 D15   BERN GRIZZLIES drive start at 12:00 (2nd). G 1-10 D15   R.Seccabian rush for 2 yards to the DEV13 (L.Auguste;A.Haritonenko). G 2-8  D13   M.Niklaus pass incomplete to R.Seccabian. G 3-8  D13   M.Niklaus pass incomplete to C.Berger. D 1-10 D20   T.Muggwyler rush for 5 yards to the DEV25 (C.Charpiloz;D.Niederhaeuser). D 2-5  D25   PENALTY DEV false start 5 yards to the DEV20. D 1-10 G33   TF.Wu rush for 18 yards to the GRI15, 1ST DOWN DEV (TEAM). D 1-10 G15   P.Troth pass incomplete to C.Drake. D 3-3  G08   Timeout Blue Devils, clock 12:00. G 1-10 G26   BERN GRIZZLIES drive start at 12:00 (2nd). G 1-10 G26   M.Niklaus sacked for loss of 4 yards to the GRI22 (A.Haritonenko). G 2-14 G22   M.Niklaus pass incomplete to U.Kaenel. G 3-14 G22   M.Niklaus pass complete to U.Kaenel for 4 yards to the GRI26. D 1-10 G41   BLUE DEVILS drive start at 12:00 (2nd). G 1-10 G10   BERN GRIZZLIES drive start at 12:00 (2nd). G 1-10 G10   O.Liechti rush for 4 yards to the GRI14 (A.Haritonenko). G 2-6  G14   R.Seccabian rush for 7 yards to the GRI21, 1ST DOWN GRI (R.Baunacke). G 1-10 G21   C.Berger rush for 3 yards to the GRI24 (D.Lamprecht). R.Seccabian recovered by DEV F.Dorlean at GRI25. D 1-10 G25   BLUE DEVILS drive start at 12:00 (2nd). D 1-10 G25   T.Muggwyler rush for 9 yards to the GRI16 (Z.Kupferschmidt). D 1-G  G10   Timeout Blue Devils, clock 12:00. D 1-G  G10   O.Froehlich rush for 10 yards to the GRI0, TOUCHDOWN, clock 12:00. D 1-G  G03   PENALTY DEV false start 5 yards to the GRI8. M.Kellenberger kickoff 36 yards to the GRI30, downed. G 1-10 G30   BERN GRIZZLIES drive start at 12:00 (2nd). G 1-10 G30   R.Seccabian rush for 4 yards to the GRI34, out-of-bounds (D.Lamprecht). G 2-6  G34   Timeout Bern Grizzlies, clock 12:00. G 1-10 G42   M.Niklaus pass incomplete to U.Kaenel. G 2-10 G42   E.Thompson rush for 3 yards to the GRI45 (M.Kiehm). G 3-7  G45   Timeout Bern Grizzlies, clock 12:00. G 3-7  G45   M.Niklaus pass complete to S.Blaser for 4 yards to the DEV47 (L.Kadek). G 4-3  D47   M.Niklaus sacked for loss of 3 yards to the GRI46 (D.Lamprecht). D 1-10 G46   BLUE DEVILS drive start at 12:00 (2nd). D 1-10 G46   End of half, clock 12:00. D 1-10 G46   Start of 3rd quarter, clock 12:00, DEV ball on DEV30. G 1-10 G35   BERN GRIZZLIES drive start at 12:00 (3rd). G 1-10 G35   R.Seccabian rush for 1 yard to the GRI36 (L.Kadek). G 2-9  G36   M.Niklaus pass incomplete to C.Charpiloz. G 1-10 G38   C.Berger rush for 4 yards to the GRI42 (M.Kiehm). G 2-6  G42   M.Niklaus pass incomplete. G 1-10 D40   R.Seccabian rush for 2 yards to the DEV38 (L.Kadek). G 2-8  D38   PENALTY GRI false start 5 yards to the DEV43. G 1-10 D19   M.Niklaus pass incomplete. G 2-10 D19   R.Seccabian rush for no gain to the DEV19 (A.Haritonenko). G 4-15 D24   M.Niklaus pass incomplete. D 1-10 D24   BLUE DEVILS drive start at 12:00 (3rd). D 1-10 D24   E.Coissy rush for 4 yards to the DEV28 (M.Egli). D 1-10 D44   E.Coissy rush for 7 yards to the GRI45. D 1-10 G36   P.Troth sacked for loss of 9 yards to the GRI45 (L.White). D 2-19 G45   P.Troth pass incomplete to T.Muggwyler. D 3-19 G45   P.Troth pass complete to C.Steffani for 18 yards to the GRI27. D 4-1  G27   Timeout Blue Devils, clock 12:00. D 4-1  G27   T.Muggwyler rush for 3 yards to the GRI24, 1ST DOWN DEV (M.Egli). D 1-10 G24   P.Troth pass incomplete to C.Steffani. D 2-10 G24   P.Troth pass incomplete to B.Fussenegger. D 1-G  G05   P.Troth pass incomplete to C.Steffani. D 2-G  G05   T.Muggwyler rush for 5 yards to the GRI0, TOUCHDOWN, clock 12:00. G 1-10 G35   R.Seccabian rush for loss of 3 yards to the GRI32 (D.Lamprecht). yards to the GRI0, TOUCHDOWN, clock 12:00. G 1-10 G27   BERN GRIZZLIES drive start at 12:00 (3rd). G 1-10 G27   E.Thompson rush for loss of 4 yards to the GRI23 (A.Haritonenko). G 2-14 G23   M.Niklaus rush for 8 yards to the GRI31, out-of-bounds. G 1-10 G40   PENALTY GRI false start 5 yards to the GRI35. E.Thompson recovered by DEV L.Auguste at DEV42. D 1-10 D42   BLUE DEVILS drive start at 12:00 (3rd). D 1-10 G44   O.Froehlich rush for 9 yards to the GRI35 (Mi.Schneider;T.Moser). D 2-1  G35   E.Coissy rush for 3 yards to the GRI32, 1ST DOWN DEV (M.Egli). D 1-10 G32   P.Troth pass incomplete to C.Steffani. D 2-10 G32   E.Coissy rush for 10 yards to the GRI22, 1ST DOWN DEV (M.Egli). DOWN DEV, TOUCHDOWN, clock 12:00. D 1-G  G03   PENALTY DEV delay of game 5 yards to the GRI8. G 1-10 G29   BERN GRIZZLIES drive start at 12:00 (4th). G 1-10 G44   R.Seccabian rush for 7 yards to the DEV45, out-of-bounds. G 2-3  D45   M.Niklaus pass incomplete. G 3-3  D45   M.Niklaus pass incomplete to S.Blaser. G 4-3  D45   M.Niklaus pass incomplete. D 1-10 D45   BLUE DEVILS drive start at 12:00 (4th). D 1-10 D45   P.Jesacher rush for 7 yards to the GRI44 (Mi.Schneider). holding (C.Steffani) 11 yards to the GRI44. D 2-3  G44   2nd and 3. D 2-3  G44   P.Troth pass incomplete. D 1-10 G29   P.Troth sacked for loss of 5 yards to the GRI34 (A.Golay). D 2-15 G34   P.Jesacher rush for 4 yards to the GRI30 (L.White). D 3-11 G30   P.Troth pass incomplete to B.Fussenegger. D 4-11 G30   P.Troth pass incomplete to B.Fussenegger. G 1-10 G30   BERN GRIZZLIES drive start at 12:00 (4th). G 1-10 G30   R.Seccabian rush for 14 yards to the GRI44, 1ST DOWN GRI (C.Drake). G 1-10 G44   R.Seccabian rush for 4 yards to the 48 yardline (R.Baunacke). G 1-10 D40   M.Niklaus pass incomplete to C.Berger. G 2-10 D40   R.Seccabian rush for no gain to the DEV40 (M.Bunderla). G 3-10 D40   M.Niklaus pass incomplete. G 4-10 D40   M.Niklaus pass incomplete to B.Kohli. D 1-10 D40   BLUE DEVILS drive start at 12:00 (4th). D 1-10 D40   E.Coissy rush for 4 yards to the DEV44 (TEAM). D 1-10 G34   Timeout Blue Devils, clock 12:00. D 1-10 G34   M.Bunderla rush for loss of 1 yard to the GRI35 (Mi.Schneider;A.Golay). D 2-11 G35   E.Coissy rush for 7 yards to the GRI28 (Mi.Schneider). D 3-4  G28   O.Froehlich rush for 2 yards to the GRI26 (TEAM). D 4-2  G26   End of game, clock 12:00.